Do you love curry spinach with cheese cubes at Indian restaurants (palak paneer) but wonder just a little about the amount of butter and cheese involved, given its obvious deliciousness? Me too. Or maybe you avoid animal products. Either way, isn’t it great that Mark Bittman has our backs? 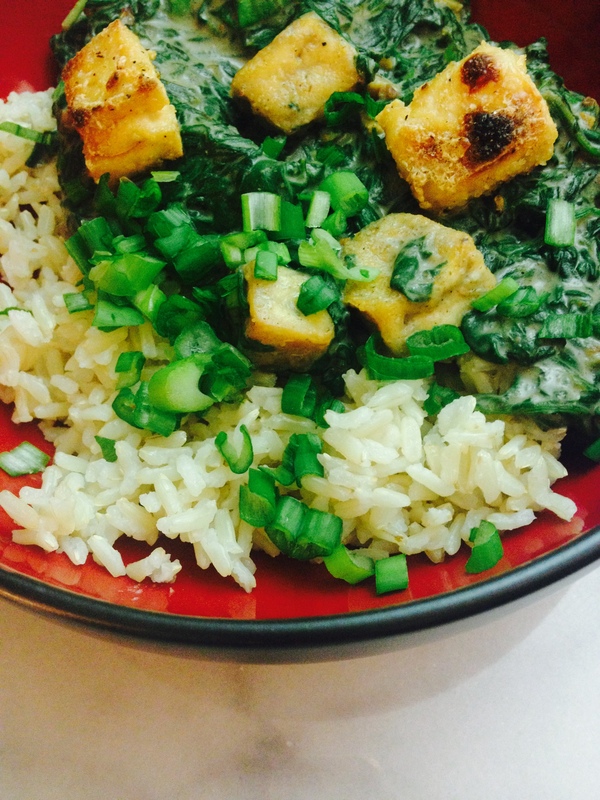 Here’s a healthy version of palak “paneer” using tofu, with only a little oil. You will not miss the butter and cheese! Also, because I noticed that Bittman refers to saag paneer in his recipe, instead of palak paneer, I Googled it to find out what the difference is. Apparently “saag” means greens, whereas “palak” means specifically spinach. Ohhh. Equipment: Large pot (5 qts works well), mini blender (like for a smoothie – I use my Ninja smoothie cup) or food processor (or if you don’t have these, a whisk will do). Start your aromatics: Add the veggie oil to your large pot over medium heat. Once hot, add the onion and ginger and cook stirring frequently, until they soften and begin to turn golden, 5-10 minutes. Make your “cream” sauce: Meanwhile, process the silken tofu in your mini-blender or food processor, or just whisk the **** out of it to make a smooth, thick sauce. Palak the “paneer”: Add the curry powder, salt, and pepper to the onion and ginger mixture, and cook, stirring constantly, for about minute, until fragrant (it will smell insanely good). Keep a cup of water off to the side. Start adding the spinach a handful at a time, until the pan is full. If it seems like it’s dry and going to burn, add a TINY drizzle of water. Stir frequently and add more spinach when there’s room, adjusting the heat as needed so spinach softens but doesn’t burn. Don’t add too much water, but definitely add a little if you think it’s going to burn. When all the spinach is used and the pan is almost dry, add the silken tofu and cook, stiring constantly and adjusting the heat until the mixture bubbles gently but steadily. Add your tofu (crispy or not) and cover. Cook, stirring once or twice, until the cubes are heated through, 2-3 minutes. Taste and adjust the seasoning. Serve, with sliced green onions if you like, and enjoy!! I like to serve this over basmati rice.